Thanks to our Website Integration Kit, the process of configuring and installs JS widgets is effortless. Open the kit and enter your API key. If you do not know how to get the key, follow this one step guide. Enter the URLs to the pages, which are used for rendering a particular page. 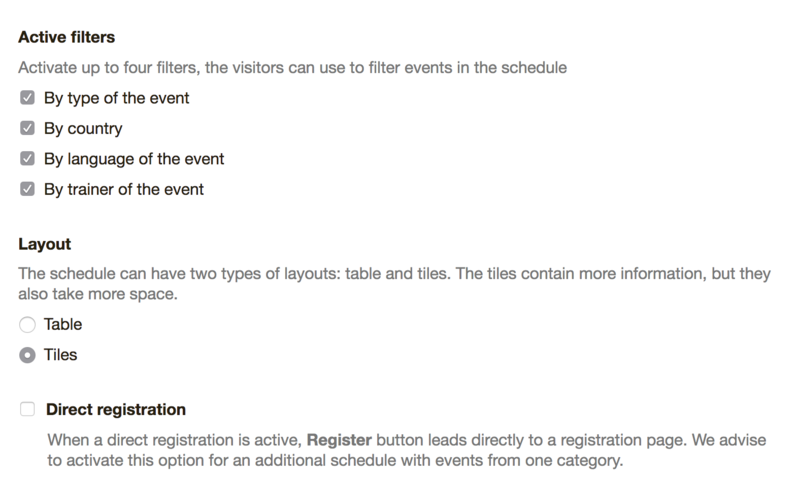 Event Page must contain a URL to the page where the EventPage widget will be placed. Trainer Profile must contain a URL to the page where the TrainerProfile widget will be placed. Do not worry you have no code for these widgets yet. You'll get it in a couple of minutes. For now, just decide what pages to use, add them to your website, and be ready to install widgets. Note: if you do not plan to use any of these widgets, enter any value to proceed. Select a theme to use. Select a widget you want to configure. Set the options you like. They are different for each widget and have a detailed explanation. If it's not clear right away, we recommend trying out the widget with different options. In the last step, copy the generated code and put it on the page.